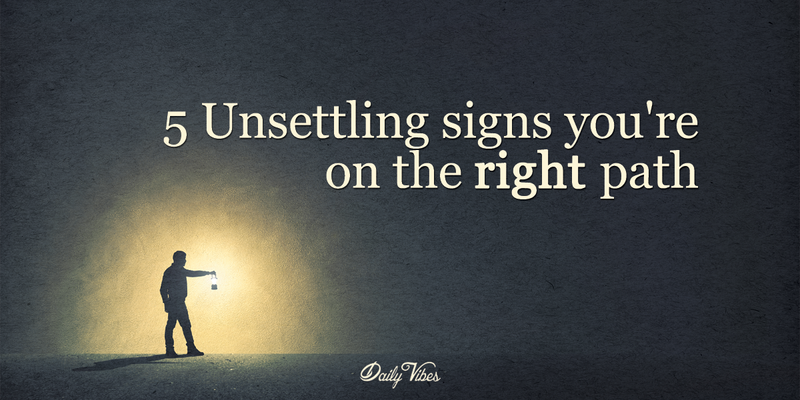 5 Unsettling Signs You’re On the Right Path. Home » mind » positive life » 5 Unsettling Signs You’re On the Right Path. Everyone wants to know that they’re doing something right, or that they’re on the right track in life. However, not everyone knows that many of the signs that tell you you’re on the right track can be scary. Change, growth, and new challenges can create uncomfortable feelings, but it’s these feelings that we have to listen to the most. It’s these feelings that let you know you’re improving and growing as an individual. This newly found autonomy is a major experience for most, which can cause you to feel an immense amount of pressure. Taking this feeling in stride, and learning that you have the power to shape your own future is a sign you’re growing up the right way. Feeling like you’re lost or like your life has no direction can be a feeling often associated with depression, but that isn’t necessarily always the case. Feelings like this could simply indicate that you’re more aware of the power you have in life to make important decisions. Again, this feeling can often be associated with depression, but it isn’t always the case. The desire to be alone could be caused by the fact that you’re entering a period of self-reflection. During major changes in our lives, we need time to sort things out, figure out exactly what we want, and just exactly how our decisions are going to change who we are. It’s hard to sort through all of it without being on our own. That doesn’t mean these issues are reoccurring, it just means that you’re becoming more aware of the triggers in your life that bring about negative emotions. This is a big deal because it means you’re becoming more self-aware. When you’re young and just starting out on your own, you may feel overwhelmed by how far you have to go to reach your goals. Whether you’re in school or starting your career, this feeling can be daunting.